Virtuoso bear Amadeus is a premium quality plush bear playing most famous and loved Mozart's compositions. Classical music for babies 0+ years of age. amadeus bear is a premium quality plush bear playing Mozart’s most well-known and loved compositions. with 40 minutes of music recordings, the bear is a wonderful, fun introduction to classical music for newborns, kids & adults. made of a super soft plush, he comes with a short composer's biography tucked inside his inner pocket. the music recordings can be switched and the volume easily controlled. safe for children 0+ years of age. with seven tracks featuring Mozart’s most well-loved compositions, Amadeus contains over 40 minutes of high-quality, professionally recorded music. amadeus is washable! when necessary, remove the music device and hand-wash the plush bear. tucked into Amadeus’ music pocket is a short Mozart autobiography. charmingly written in first person, it shares a brief history of the composer’s life as well as the title of each musical selection. 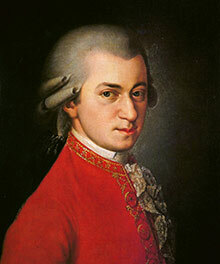 Wolfgang Amadeus Mozart (1756-1791) gave the world many of its most beautiful and beloved compositions. through his musical creations great and small—from sonatas to operas—his genius touches listeners and performers each and every day throughout the world. be the first to know about promotions and new arrivals!